Of all the Dead Sea Scrolls, one stands out because it’s made of copper and contains directions for finding a huge secret cache of treasure. Jimmy Akin and Dom Bettinelli talk about the origins of the scroll, what it says, and Jimmy’s own unique theory for why it exists. 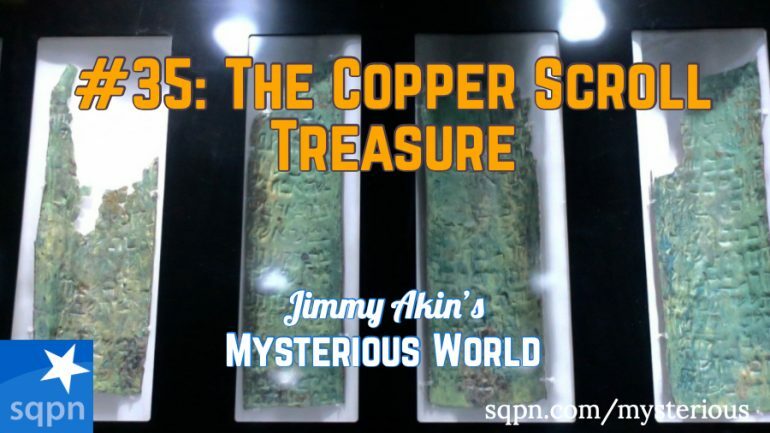 Help us continue to offer Jimmy Akin’s Mysterious World. Won’t you make a pledge at SQPN.com/give today? Please spread the word about the podcast. Leave us a review on iTunes! Purchase the books and other material from this and other episodes at the Mysterious World Bookstore. Check out Jimmy Akin’s blog and Dom Bettinelli’s blog. Join the conversation at the Starquest Facebook page and the Jimmy Akin’s Mysterious World Facebook page.